Are you interested in a mid-market lift chair that looks great? 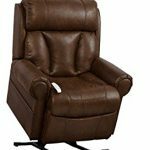 Check out the AS-9001 lift chair from Windermere Motion. It has a split back, plush pillows, and a great design. Read on to find out more. The AS-9001 is a 3-position lift chair that has a maximum weight capacity of 375 pounds. It is only available in Tobacco. It has a 22″ seat width and weights 114 pounds. There are two magazine pockets on the chair. They are below the left and right arms. Windermere Motion is related to Mega Motion. They have very similar lift chairs. There are no reviews for this chair. If you own it, please write your review down below. The chair costs $995. This is $68 less than the average cost of a 3-position lift chair. The warranty is a 1 year warranty with a lifetime warranty on the frame. This great looking chair is reasonably priced. Its warranty could be a lot better; hence, we are rating it 4 out of 5 stars. Buy on Amazon.